To understand the anatomy, the tooth is made up of three layers. The outermost part is the very hard enamel and the innermost part is pulp which contains all the nerves and blood vessels of the tooth. The part between the pulp and enamel is dentine. A fully developed tooth can survive without pulp. Root canal treatment treats the innermost part of the tooth which is called pulp. When decay (cavity) penetrates the outer two parts of the tooth (enamel and dentin), it reaches the pulp (which has nerves and blood vessels). The inflammation gives rise to a feeling of excruciating pain. Other reasons can also damage the tooth such as tooth trauma and faulty crowns. Once the pulp gets damaged, the pain and infection will not stop unless the pulp is completely removed. How does Root canal treatment can save the tooth? During Root canal treatment, the inflamed or damaged pulp is removed and the root canals are cleaned with various solutions and filled. The space is filled and sealed with a plastic rubber like material called gutta-percha. 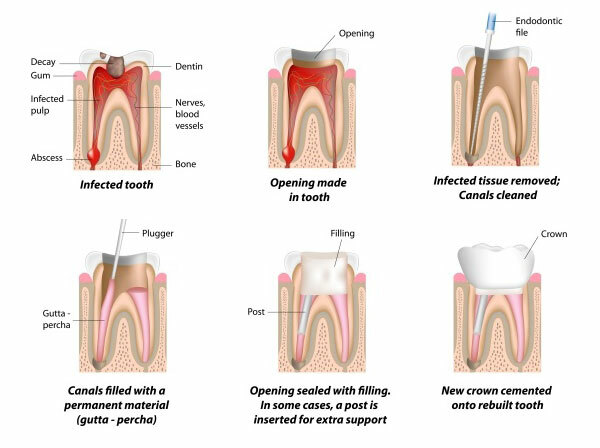 The Root canal treated tooth becomes brittle and needs core buildup and a crown in order to save the remaining tooth structure. How long Root canal treated tooth lasts in mouth ? If properly cared for, the root canal treated tooth can last as long as the other natural teeth.